Samsung Omnia is a high end smartphone range featuring mobile phones in Symbian, Windows mobile platforms. 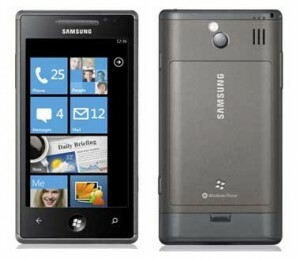 Samsung today announced an upgraded version of the Samsung Omnia for Windows with new Windows phone 7 operating system. The Samsung Omnia 7 or Samsung I8700 Omnia 7 features the Super AMOLED display the that we have seen in Samsung Galaxy S and Samsung Wave smartphones. The Samsung Omnia 7 is therefore the best Windows phone 7 device announced today, in terms of the display quality. The bar shaped Samsung Omnia 7 has a 4.0 inch display with 16M colors color support, 480 x 800 pixels resolution and multi-touch input support. Like all other handsets in the category, Samsung Omnia shares the default Windows phone 7 interface. Like in HTC and LG Windows phone devices, Samsung Omnia 7 includes a1GHZ Snapdragon processor. It’s surprising move from Samsung not using their own Hummingbird CPU. Nevertheless, the phone is extremely fast and showcase stunning visual quality on browsing web pages, watching movies and when moving through different options in the Windows phone 7 OS. Samsung Omnia 7 has three buttons under the home screen, an iPhone like home button, back and the search. The device is available in 8GB and 16GB storage options and without a card slot. The Samsung Omnia 7 has 5 MP camera with LED flash, auto focus, and it supports 720p HD video recording @25 fps. The new Omnia 7 is built to work on almost all mobile phone networks in the world with the quad-band GSM and HSDPA, HSUPA high speed data connections. Other features of the Samsung Omnia 7 include Wi-Fi, Bluetooth, Digital compass, 1500 mAh battery, YouTube, Facebook, Twitter applications, Document reader, FM radio with RDS, etc. AT&T and Samsung will launch Samsung I8700 Omnia 7 in USA on 8th November 2010. The price of Samsung Omnia 7 is not yet announced, but we believe that it would cost $199 with a 2 year AT&T plan. India and other Asian countries will get a contact free model of the Samsung Omnia 7 by the end of this year.